WASHINGTON (May 17, 2007) -- Ballet isn't for everybody, but occasionally, exceptions can be made. This Sunday, on G Street in Washington, D.C., the National Building Museum is hosting a ballet that features music from Pyotr Ilyich Tchaikovsky's Swan Lake, and choreographed performances by dance artists, ballet students and construction equipment. Perhaps one of the greatest draws at the National Building Museum is the museum building itself. The building, constructed of 15 million bricks, features some of the largest indoor columns in the world in its "Great Hall." The hall measure 316 feet by 116 feet by 159 feet tall at its peak, and has been the site for presidential inaugurations for Grover Cleveland and George H.W. Bush. The museum hosts some 23,000 school kids each year. "Imagine giant backhoes, and earth movers, being choreographed with ballet dancers to Swan Lake," said Sarah Rice, family programs coordinator at the museum. "I think it really appeals to dad. It has massive earth movers, but there are ballet dancers interacting with them." The performance, entitled "Pas de Dirt," lasts 15 minutes, and will run three times, at 2 p.m., 3 p.m. and 4 p.m. It's also free, like many of the exhibits inside the museum. The National Building Museum was founded in 1980 to celebrate and explore American achievements in architecture, engineering, design, urban planning and construction. "I think it appeals to anybody, because the built environment is our mission," said Rice. "'The world we build for ourselves' is sort of our tagline, and I think that is a concept that applies to all of us, because we all inhabit the built environment. So what we try to do through our exhibitions is showcase wonderful achievements in that, from world class architects to how things work, to the way things look and why they look the way they do." One of the long running exhibits at the museum involves Washington, D.C., itself. As part of the exhibit, visitors can see how the federal city was originally designed, see how it looks today, and learn about some of the decisions that affected how the city has changed. Also part of that exhibit are scale models of buildings like the U.S. Capitol and the White House. And unlike other museums, patrons are encouraged to touch and explore the exhibits. "We like to call ourselves a place of doing," Rice said. "Many of our exhibitions are family friendly, so we encourage families to come and explore them on their own. That's one of the great things about this museum. All of our family programs involve people, where you are active or either involved in critical thinking or you are able to do hands on stuff, or you create something to take home. It is very active." In April 2006, the museum added an exhibit space for children ages 2 to 6. In the "Building Zone," young children, accompanied by their parents, can engage in construction play, as though they were builders. "Folks can come and have an imaginative place, all about the built environment," Rice said. "We've got giant Legos, bricks, a playhouse, construction trucks, and a dress up station where you can pretend you are a construction worker." In June, the museum will host author and illustrator David Macaulay, author of such books as "Cathedral," "Mosque," "Pyramid," "City" and "Underground." The books, illustrated with pen and ink line art, document the construction of various, monumental types or architecture. Macaulay will be on hand, June 23, to kick off an exhibition entitled "David Macaulay: The Art of Drawing Architecture." "Macaulay will be here, talking with the audience and doing book signing," Rice said. "Also there will be lots of interactive exercises, chalk artists on the sidewalk, caricature artists, kid-themed workshops, adult-themed workshops and dancers." The exhibit, which runs through January 2008 will look at Macaulay's process and product of drawing the built environment. It will also include hands-on activity areas within the exhibition where families can go through the show, learn and see, and then sit down and try to do some of the drawing exercises in the style of Macaulay's work. Most of the activities at the museum are hands on, and family friendly. Weekends at the museum include "art carts," where groups, ages 5 and up, can get involved in half-hour long programs that explore such things as bridge building or arch and truss construction. The museum also runs a design apprenticeship program for D.C. teens who are interested in engineering, architecture and design. A more adult exhibit is the recent "Green House," which includes an indoor mock-up of a home that is built with an emphasis on sustainable architecture and design. "This is where we are saying the Earth is a resource we need to take good care of and what is a way we can do that through building and sustainable design," said Rice. Perhaps one of the greatest draws at the National Building Museum is the museum building itself. The building was originally designed in 1881 by Army General Montgomery C. Meigs, to serve the U.S. Pension Office. It was meant to house a pension office that needed to be expanded to serve the veterans who had served in the Civil War. The building is constructed of 15 million bricks, and features some of the largest indoor columns in the world in its "Great Hall." The hall measure 316 feet by 116 feet by 159 feet tall at its peak, and is supported by columns measuring 75 feet high, 8 feet in diameter, and 25 foot in circumference. Each of the columns is built of 70,000 bricks. Rice said the monumental size of the hall impresses the 23,000 school kids that visit the museum each year. "The first thing they are struck with is the awesomeness of the space and how monumental it is and how it makes them feel so small -- in a cool way," she said. 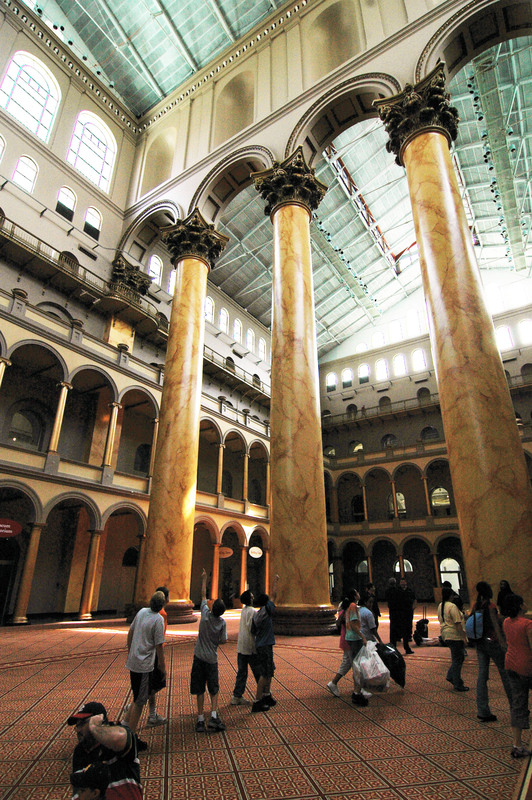 The National Building Museum is located above the Judiciary Square Metro station, on the Red Line. It is open Monday through Saturday 10 a.m. to 5 p.m., and Sunday 11 a.m. to 5 p.m.